The next generation of storefront advertising has arrived! 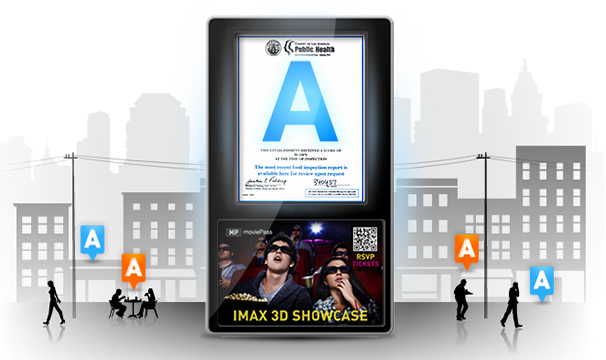 The Grade A SmartSign℠ delivers an innovative end-to-end ad solution that networks A-rated restaurants in top locations with national brands, proximity advertisers & smart-phone enabled consumers. It’s a brand new way to get noticed. The Grade A SmartSign℠ illuminates restaurant’s required bright blue A-cards and transforms them from required signage into a dynamic, WiFi-enabled video display, which delivers ad content & generates ad revenue. Powered by a state-of-the-art, geo-targeted ad platform server, Grade A Sign℠ focuses on high-traffic, A-graded food establishments creating a powerful, street-level advertising solution. One minute you’re on topic and the next minute you’re in “left field” as your agenda topic has been taken to a tangent. should be transferred to you from the web developer. Off we would go rock hopping and fishing all day long. Useful post, thanks. Recently have been successfully advertising by pop-under some products on http://ads1k.com/ and the campaign conversion was quite good if i may say so. Any serious advertiser interested in a pop-up pop-under network should add to the arsenal of net links.